The book presents a systematic and compact treatment of the qualitative theory of half-linear differential equations. It contains the most updated and comprehensive material and represents the first attempt to present the results of the rapidly developing theory of half-linear differential equations in a unified form. 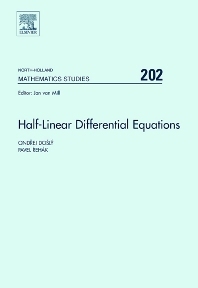 The main topics covered by the book are oscillation and asymptotic theory and the theory of boundary value problems associated with half-linear equations, but the book also contains a treatment of related topics like PDE’s with p-Laplacian, half-linear difference equations and various more general nonlinear differential equations. The first complete treatment of the qualitative theory of half-linear differential equations. Comparison of linear and half-linear theory. Systematic approach to half-linear oscillation and asymptotic theory. Useful as a reference book in the topic. University libraries worthwide, individuals interested in the topics.